A cutlass is a sword right? And a car as well, so it seems appropriate to name a guitar that. It's such a swashbuckling sort of name. This is a new model for Music Man. It is set up with one humbucker in the bridge with two single coil pickups. 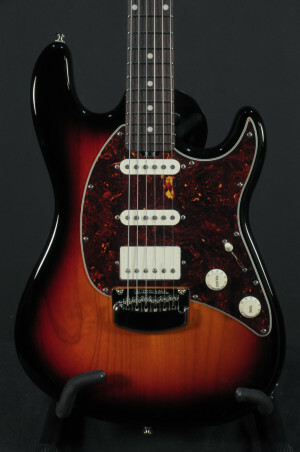 It has a vintage sunburst finish, rosewood fingerboard and tremelo. The pickup set up is awesome, very versatile. The neck feels great, the sound is phenomenal. I like this model a lot, it has a vintage vibe with a modern sensibility. It covers all the basses. Comes with hard case. The Ernie Ball Music Man Cutlass guitar pays homage to the vintage styling and cosmetic appeal of Leo Fender’s original Music Man models. Updated vintage spec electronics, super smooth vintage tremolo system, and lightweight alder and african mahogany bodies are welcome refinements to these new modern renditions. Now available with a new Ernie Ball Music Man custom designed bridge humbucker delivering crunchy rhythm and cutting lead tones. The new HSS Cutlass bridge humbucker gives added output with warm vintage style tonality. Ever since its introduction to the world in 1976, the Music Man StingRay has been an edgy alternative to the bass guitar status quo. StingRay players love its look, they love its growl, and most of all, they love its versatility. The StingRay is known for being outfitted with a sole bridge humbucker, delivering heavy punch and effortlessly cutting through any mix with clarity. The electronics consist of a 3-Band EQ with bass, mid, and treble controls and a master volume control. Of course, you never lose any of that signature StingRay sound! Constructed in America and comes with hardshell case. Hand made in the USA. The Sadowsky Metro MV4 is simply an incredible bass. Sadowsky's build quality is incredible. These basses feel so smooth, they are perfection. Featuring an Ash body with Vintage Tint Natural finish and full maple neck. Tonally this bass has superb defination and clarity. Active 2 band preamp and passive VTC (Vintage tone control) allows everything from modern cutting tones, to the best retro sounds you have ever heard coming out of the one instrument. It's like a Jazz Bass on steroids. These basses are true modern classics. Comes with Sadowsky Protec hard gig bag. I cannot believe it's been 40 years since Music Man released the Stingray Bass. That makes me feel old...really old. I was quite impressed when they first came out. The Stingray was a giant leap forward for the bass market. The '76 Fender basses were not cutting the mustard, and this gave bass players something they could sink their teeth into. 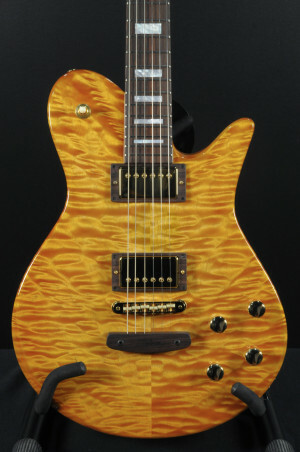 This is a faithful reproduction, called the "Old Smoothie" because it sounds and looks smooth as silk. Music Man went all out to reproduce this classic bass. It's got the right pickup, the right neck profile, the right frets, the right finish, and the right sound. It's the right bass for you.